An annual fair at Sensoji Temple, Asakusa, Tokyo. 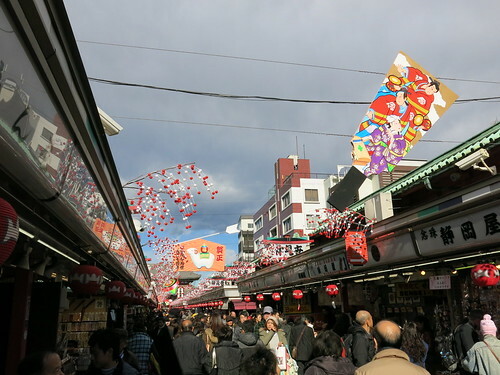 Every year, Hagoita-ichi or battledore fair takes place in Sensoji Temple in Asakusa for a few days in mid December. This is a traditional fair that dates back to the Edo period (1603-1868). A hagoita is a rectangular shaped wooden paddle used for playing a New Year game called hanetsuki. Just like badminton, hanetsuki is a game played with a shuttlecock and hagoita as a racket. Originally, hagoita was given to and played by girls. Now, most of the ones sold at the fair are not for playing but for ornamental purpose. Traditionally, hagoita is considered as good luck charm. 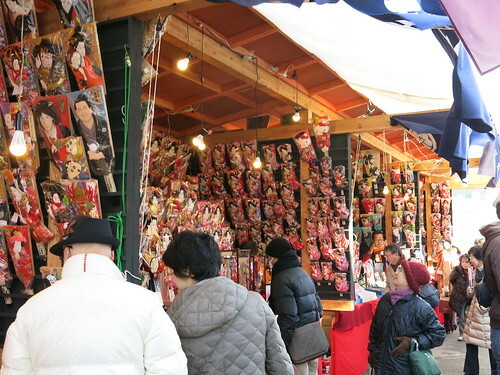 At Hagoita-ichi, you will see dozens of stalls selling colorful 3D and 2D hagoita. The common designs of hagoita is a women in kimono and kabuki actors. You can also find hagoita with faces of actors/actresses, politicians, athletes and manga characters that were especially much-talked-about that year. 3 min walk from Asakusa Sta. on Tokyo Metro Ginza Line and Toei Asakusa Line. December 17th – 19th, every year.